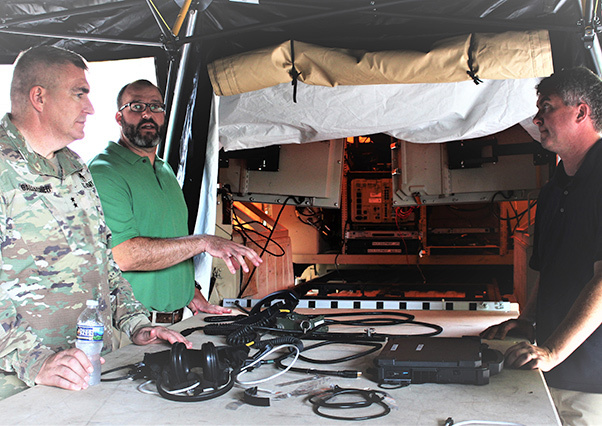 Army command post stakeholders recently attended a demonstration here that featured emerging expeditionary mission command technologies with one primary benchmark — mobility. Hosted by the U.S. Army Research, Development and Engineering Command’s Communications-Electronics Center, the Expeditionary Mission Command Science and Technology Objective-Demonstration, or EMC STO-D, capstone event culminated a three-year initiative that produced Soldier-vetted capabilities with all of the goodness of traditional command posts — and as a plus, made them mobile. The event also provided an opportunity to preview concepts for the next phase of command posts, which featured a new touchstone: survivability. Dan Lenhardt, U.S. Army Communications-Electronics Center lead engineer, demonstrates the Single Multimodal Android Service for Human Computer Interaction, which allows Soldiers to use automatic speech recognition to interact with software while maintaining eyes on surroundings and hands on weapons. 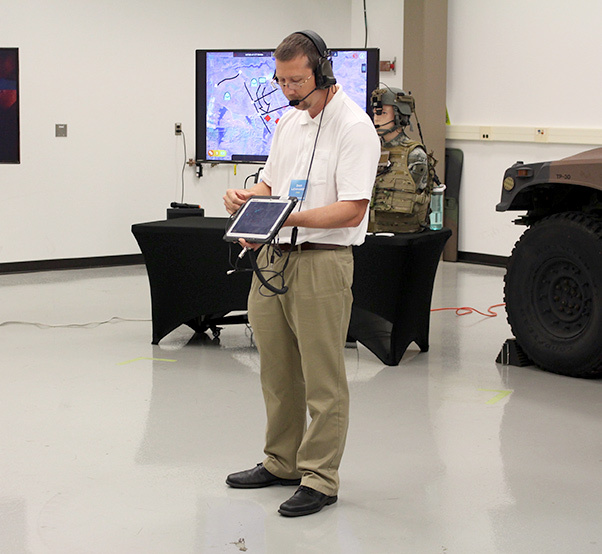 Attendees visited three separate demonstration areas: mobile mission command platforms and display systems, mission command software, and energy-informed “smart energy” operations, with power being a critical component to enable mobile command post operations. EMC STO-D engineers and consultants lead the demonstrations and discussions, but were supported by several Soldiers with hands-on experience using the capabilities from the Army’s National Training Center in Fort Irwin, California and the 101 Airborne Division (Air Assault), 3rd Battalion, from Fort Campbell, Ky. The EMC STO-D Soldier demonstrators joined hundreds more from 14 Army posts and 10 unit patches across many continents and companies to help provide critical feedback that influenced, and continues to influence, the technologies’ maturity. Sgts. 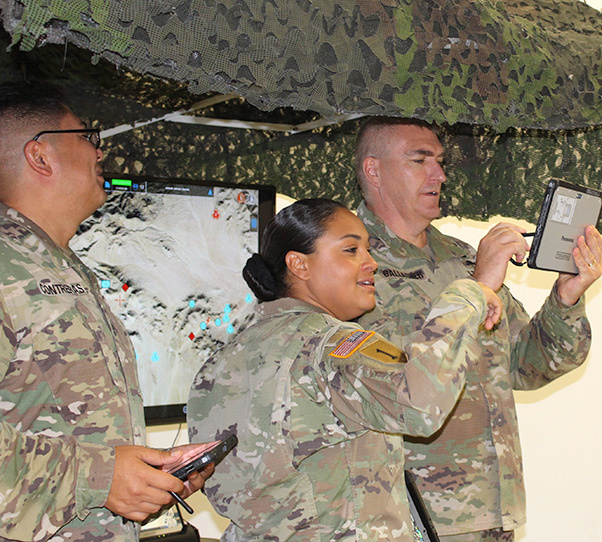 1st Class Ramon Contreras, Jr., left and Seena Ferrell, center, observer controller/trainers at the National Training Center, Fort Irwin, California, demonstrate the Tactical Computing Environment (TCE) to Maj. Gen. Pete Gallagher, the U.S. Army’s Network Cross Functional Team Director. 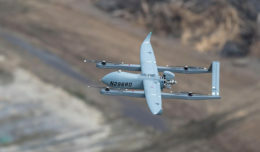 The event ultimately underlined the critical role effective mission command plays in every combat operation, noted Chris Manning, the director for the center’s Command, Power and Integration Directorate. 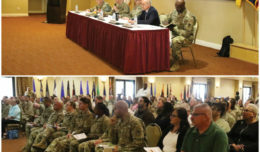 “Our expertise in mission command uniquely positions us to look at the Army’s command post requirements holistically, assess risk, and inform the Army of what’s possible and provide options,” said Manning. Sgt. 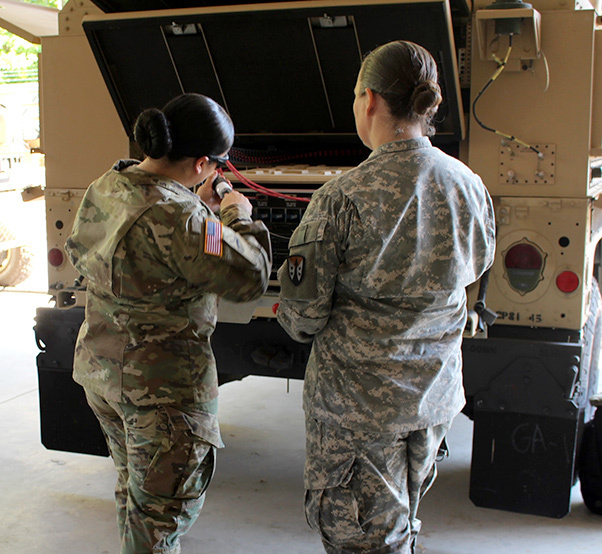 Keila Peters, left, assigned to the U.S. Army Communications-Electronics Center, and Staff Sgt. Evelien Josselin, U.S. Army Sustainment Command-Army Reserve Element Detachment 7, demonstrate the ease in loading and unloading server stacks onto the Command Post Platform (Improved), which provides mobile support for command and control equipment in a reduced footprint over previous solutions. As the focus shifts to survivability, Barton discussed options on how to effectively implement mobile command post capabilities. 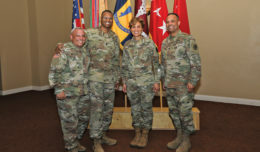 The EMC STO-D team achieved its goals to develop and demonstrate commander-focused mission command software applications, infrastructure, and energy efficient command post concept technology demonstrators that enable expeditionary maneuver and effective, uninterrupted mission command operations, Barton said. Tyler Barton, EMC STO-D Manager, center, and Brad McNeilly-Anta, Command Post consultant, right, demonstrate to Maj. General Pete Gallagher, the U.S. Army’s Network Cross Functional Team Director, how the Light-Mobile Command Post’s quick erect table and large screen displays are key time saving capabilities when setting up and tearing down the command post. 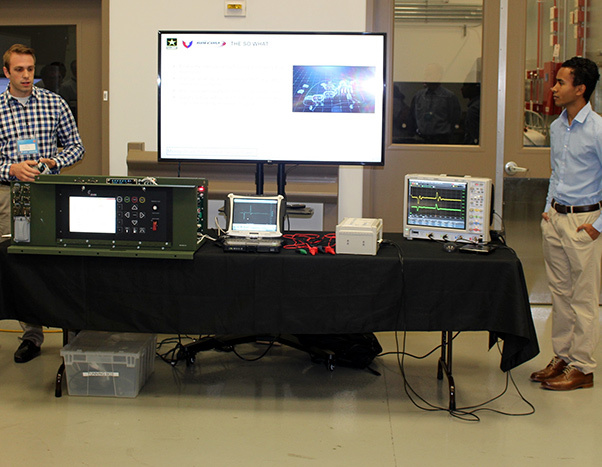 Joe Vitale, left, and Blane Wilson, U.S. Army Communications-Electronics Center electrical engineers, demonstrate the Energy Informed Operations software application, which works through an intelligent microgrid to allow Soldiers to interactively monitor and manage power systems.